The past few years have seen the advent of diode chips, which have leaded to the production of medical diode lasers. These lasers are portable and simple to use in comparison with classic large, high-maintenance and expensive lasers. BIOSPEC's high-power diode laser systems LPhT-630/675-01-BIOSPEC are among the best and affordable devices for photodynamic therapy worldwide. High power and wide choice of wavelengths of light emitting diodes (LED) in the market have facilitated the production of LED sources for therapy and diagnostics. These devices are the most inexpensive way to carry out photodynamic therapy of superficial tumors. BIOSPEC's LED systems UFPh-630/675-01-BIOSPEC have built-in imager allowing visual control of photosensitizer accumulation along with therapy and before and after therapy. Classic filtered lamp light sources step to an advanced stage of development with the advent of new types of lamps. 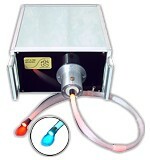 BIOSPEC develops lamp light sources parallel with laser and LED systems.